This "Design Your Own" medical ID bead bracelet is perfect for you to build your very own medical alert id bracelet with your interchangeable European bead charms (Pandora-compatible). 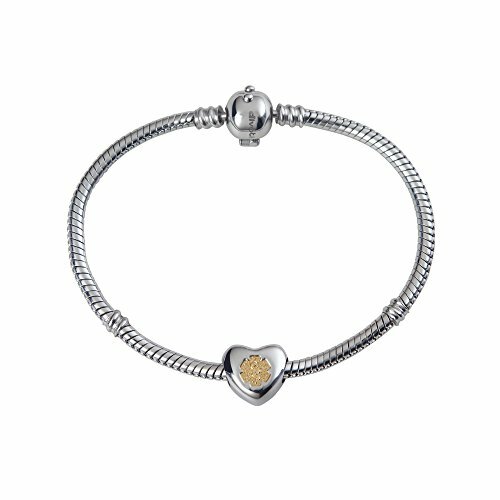 Our starter bracelet features bead clasp, 4 bead stations with external threads for stopper/spacer beads, a solid stainless heart bead with PVD gold-plated caduceus symbol on front that is internationally recognized by first responders, alerting them to the medical information engraved on the back. EASY-TO-READ (custom engraving black on white metal for your safety-see photo. Consult with your physician before submitting medical ID engraving information. Only critically necessary information should be included for a health care provider. Custom engraved in high contrast black laser engraving to personalize your medical message (3 lines of 5/8/4 characters, spaces included). Hypoallergenic 316L medical alert bracelet-6" cuff style (fits 7.5-8.5 inches). Deep embossed caduceus symbol with hard enamel symbol on the front of medical alert bracelet. Excellent wear resistance.